Durable and comfortable wetsuit pants from Peak. 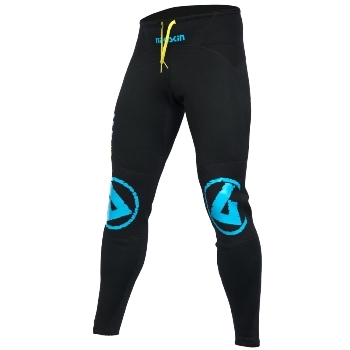 The Peak Neoskin Pants are full length neoprene trousers with reinforced knees and seat. The Peak Neoskin pants are durable and comfortable as well as offering additional warmth on colder days. Separate neoprene trousers offer an excellent alternative to a full wetsuit if you already have a dry cag and don't want the restriction of the full wetsuit. High back cut for seated use. Mixture of 1.5 and 2.5mm neoprene. Thicker / tougher material on back, hips and knees.